Home » What Alternative Life Insurance Options Have People With Diseases? Getting life insurance is not always easy for people whose health is affected by illness and pre-conditions. Insurance is all about risk management, therefore many medical issues are seen by insurers as increased risk – and they price that risk accordingly. A person without significant health issues can benefit from the low rates of standard insurance, which is also known as traditionally underwritten insurance. 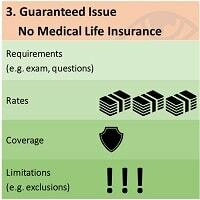 If you have a serious medical pre-condition that will prevent you from qualifying for a standard rate, you have three other options. We will discuss these options below. Before starting, however, it is important to note that you can always get a life insurance policy – the difference will be in the costs and coverage offered. That being said, there are other factors that can increase your life insurance quote, such as if you are smoker. Smokers’ life insurance premiums are roughly double than for those who have a similar profile (such as age, gender, medical pre-conditions) but do not smoke. 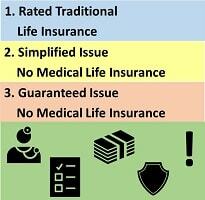 With that in mind, let’s look at the three life insurance alternatives for people with diseases. The first option to get life insurance if you have a particular disease or pre-condition, is still to consider traditional life insurance policies. You may qualify for a standard policy, but at a different rate. This is called a “rated” policy. 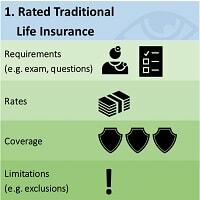 A rated policy offers all the benefits of a standard life insurance policy, but comes at a higher cost. For example, if you are a male/female, 35 years old and have a light diabetes pre-condition, your quote for life insurance would be around $22 per month. However, if your pre-condition is serious and you cannot control your blood sugars, your premiums would go up to around $50. People with very serious diseases may not quality for a rated policy, so their next option is a simplified issue no medical policy quote. 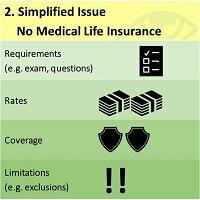 Simplified issue no medical life insurance is the least expensive type of no medical life insurance. It comes without a medical exam but has a list of insurance questions that you are required to answer. Simplified issue insurance has some limitations on maximum insurance coverage limits, and the benefit typically ranges from $50K to $300K. It is important to check with an insurance provider or broker to see if your policy comes with an “immediate claim payouts”. An immediate claim payout means that an insurance claim can be submitted even if a policyholder passes away immediately after getting a life insurance policy. A policy with “deferred payouts” will not pay a death benefit within the first one or two years. These options depend on the policy’s specific conditions, and these options also affect the premium. A simplified issue life insurance quote will give you an idea of the premiums you will need to plan for. Guaranteed issue life insurance quotes always result in the highest insurance rates. This is because guaranteed issue policies do not come with a medical exam, or even a medical questionnaire. For this reason, it is also known as “always pre-approved” life insurance. In addition to its high premium, this insurance type has two other drawbacks. First, insurance coverage for guaranteed issue policies is quite limited – up to $25,000; that does not leave beneficiaries with a lot of coverage. Second, this type of insurance usually comes with a two-year waiting period. That means if the insured life passes away within two years of the policy being purchased, a claim will not be paid (but usually, premiums will be returned to the policy holder). The waiting period is added to prevent people from buying life insurance when they already know in advance that they will die soon. Despite its drawbacks, guaranteed issue insurance is quite popular and is often used as funeral insurance (also called final expenses or burial insurance) when a policyholder wants beneficiaries to have enough money to cover funeral expenses. Choosing the right life insurance if you have been diagnosed with a particular disease is not as straightforward as getting life insurance when you are healthy and fit. You should work with an experienced insurance broker, as opposed to searching for insurance on your own, if you have a health condition. Brokers have extensive experience in helping difficult-to-insure clients apply for the right life insurance policy. Our brokers can help you a life insurance quote even if you have pre-conditions. Another suggestion is to find out first if you can apply for a cheaper insurance policy, as opposed to going immediately for the most expensive type of no medical life insurance. You may think that your situation will not get you standard policy, but some insurers have flexible qualification criteria. If your condition is being properly managed or has occurred in the past, you may qualify for a standard policy. This is precisely why an experienced broker is the best person to speak with if you need life insurance but have a pre-condition. There is a hidden trap in being declined for any insurance type, but a knowledgeable insurance broker can work through this as well. If you have been declined for a standard life insurance policy and try to answer a simplified life insurance questionnaire, it may ask you if you have ever been declined for life insurance. If you reply “yes” (you must answer truthfully to prevent future claims from being denied) you will severely limit your chances of being approved. Again, an insurance broker can help through this process by checking the conditions of a life insurance company before you complete a full application.